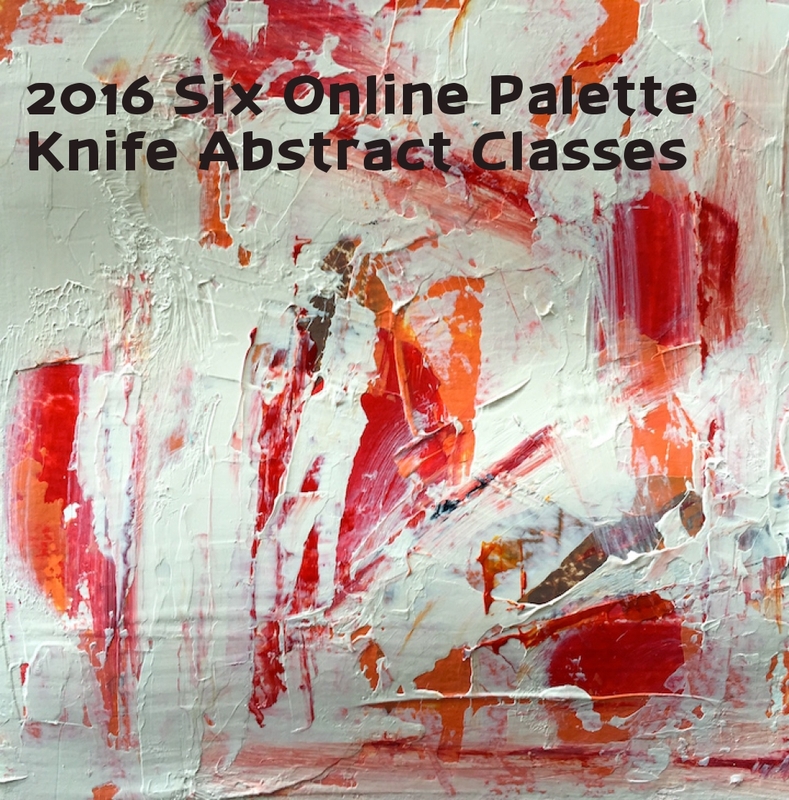 How do the Palette Knife Painting Classes work? My Online Palette Knife Painting Classs consist of videotaped demonstrations that take you through the experience of painting a palette knife painting from start to finish. The video starts with the selection of subject matter which might include setting up a still life and showing how I photograph my subjects. It may show how I photograph boats on a pier. The next step is setting up the composition on canvas, followed by how I premix my color palette. Then I paint the entire painting with a palette knife which includes blocking in the shapes of my painting, matching values and temperatures, adding detail and finishing with highlights. Each online class has it's own webpage that you can visit indefinitely. You can download the inspiration photo the inspiration photo plus view the demonstratin videos. Each class consists of 10 - 18 videos. You can take your time and finish the painting anytime! The fee is $35 per online class. You can save 35% by purchasing a one year block of classes (at $25.00 each). 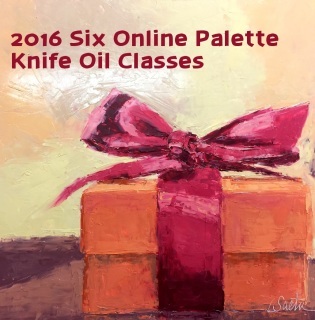 That's twelve on-line classes for less than the cost of one workshop! 1. When can I watch the Online Palette Knife Painting classes? - All of the Online Classes are hosted on this site. You need to first purchase the class. Within a few hours you will be sent a link to register. You will be asked to create a password and sign in to the class. Please use the same email you used to register for the class. You can choose any password you want. Just don't forget it! (If you signed up for twelve monhts of classes then you will always use the same log in information.) FYI, you only need to register once as you will have access to all purchased classes thereafter on this site. To access the classes go to the heading CLASSES where you will see a drop down to each month's class. On the first Monday of each month you will be able to access the page. You can watch the videos as many times as you want and paint anytime. Please note that you will need to visit this website to view the classes each month. I will not be sending a reminder email. 2. Will all your demos be painted with a palette knife? - Yes, but of course you can use a brush for your painting if you want. 3. Do I have to paint the same size canvas you suggest? - Of course not, its up to you. In each demo I will explain the size canvas used for the painting and why I chose the size. Some paintings will be standard sizes such as 11" x 14" whereas other may be in a larger format such as 24" x 36". The suggested canvas size is listed in the class description for each class. 4. How long do I have to view the video? - The demo is released on the first Monday of the month, and currently there is no expiration date to enjoy the online demonstration. 6. 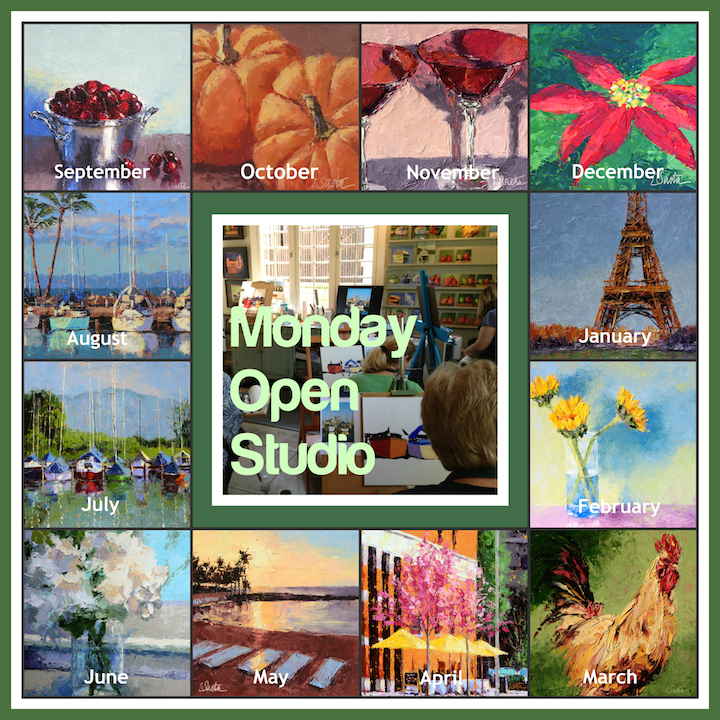 Are the online classes the same as your workshops? - No. 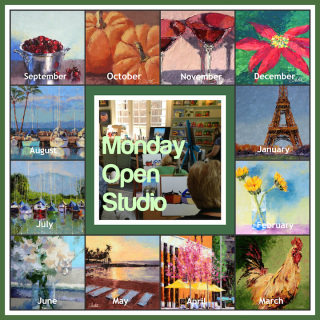 All of the online classes are different themes and paintings than those taught at my workshops. However, you may want to try both! ​is $35.00 each. Get a special price of $195 for six classes.